A water main break flooded about 10 houses and several residential streets. 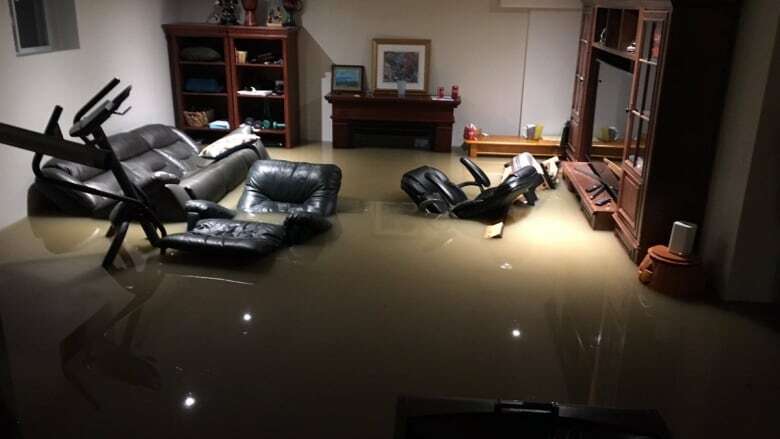 Mayor John Belvedere said the basements of some homes are under two metres of water. Paul Goblot's son woke him up at 5 a.m. to find water pouring into the family's finished basement on Julien Avenue in Pointe-Claire. Within 30 minutes, the basement furniture and exercise equipment were submerged, and Goblot wasn't the only one waking up to a disaster. Sections of Lakeshore Drive, Drayton Avenue and Brunet Avenue are closed as a result. 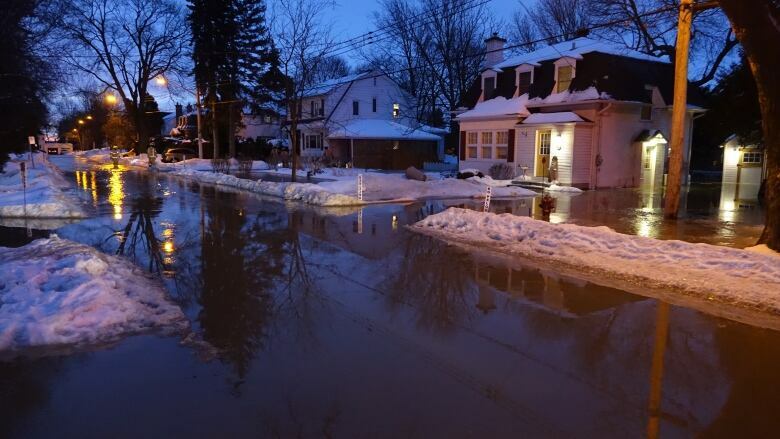 Firefighters were called to the scene around 4:30 a.m. after residents on Marie-Anne and Victoria avenues reported flooding, according to Marwan Shedeed, chief of operations for the Montreal fire department. Nobody was injured and the homes did not need to be evacuated, but firefighters were busy pumping water out of basements throughout the morning, he said. 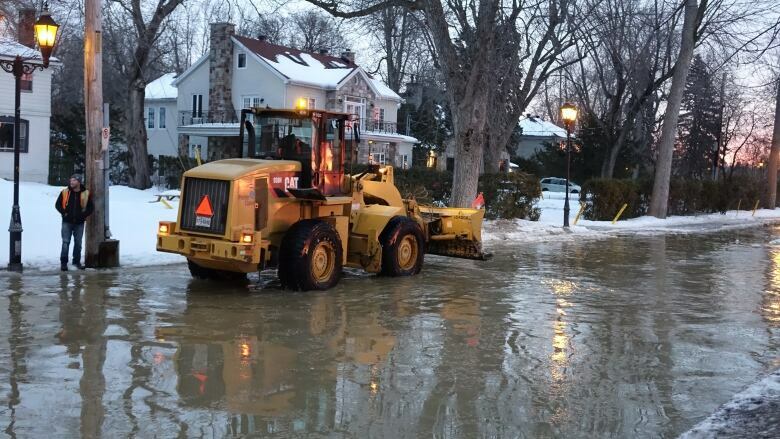 Streets and driveways were covered by several centimetres of standing water early Tuesday, and there was two-thirds of a metre of water accumulation on Lakeshore Drive. The city shut three valves to the water main by 8 a.m., ensuring water was no longer pouring out, Belvedere said. The break, likely caused by the inclement weather, probably occurred in a 24-inch pipe, or a pipe connected to main of that size, he said. "We realize that it's going to get cold soon, too," he said. "So there's a lot of stuff going on right now to try to clean it up as fast as possible." The city is delivering bottled water to all the affected homes, as crews works to repair the break. Belvedere said he doesn't know how long it will take to repair the damage and turn the water back on. Some homes have furnaces in their basements, meaning they may be without heat. "People will have to call their own insurance and get some specialized companies in now to get them taken care of," he said. Among those calling their insurance company will be Goblot and his wife, Louise Zlnay. "Water was gushing in at 5 o'clock in the morning," said Zlnay. "So we have floating furniture." That furniture is floating over hardwood floors and, in the garage, an electric Tesla is submerged in water. Luke Johnston, who lives on Brunet Avenue, told CBC the damage to his property is extensive. "This is very shocking to wake up to on a regular work day," he said. "When I saw the water, there wasn't much I could do because it was coming through the side door as well as the basement windows." Within a half hour, there were about a dozen firefighters at his house, trying to pump it out into the street even as it poured in through the window. But, like the others, the damage extended well beyond his basement. "We have a hot tub in the backyard and I know the electrical framework inside of it is zapped," he said. "The electric box in the basement will most likely have to be rewired as well." His father jumped in Johnston's car to move it to higher ground in the wee hours of the morning, but the car was already marinating in ice-cold, murky water. "When he got in, there was water right up to the seat," said Johnston. "He was sitting in water like he was about to take a bath driving down the street."